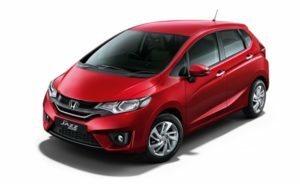 The Honda Jazz 2016 is based on the new Honda City and is 55mm longer than the previous generation. Honda internally calls this design as Crossfade Monoform design. The fascia of the Honda Jazz 2016 resembles the Honda City. It has a similar front grille, though it doesn’t get the chrome finish. Honda is targeting the Honda Jazz 2016 for the youth or those you prefer trendy styling over subtle. The headlamps are single barrel and the front bumpers are different from the City.The side profile of the Honda Jazz 2016 is a lot similar to the previous generation as it still retains the same design philosophy like the quarter glass panel, blacked out pillars and the large glass-in area. The tail lamps and rear styling too remind you of the previous Jazz, but it does look fresh with LED tail lamps.